HMI SCOOPS FEATURING DJAKOUT#1 + MORE! 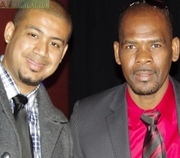 *DJAKOUT COMPASFEST/MICHEL MARTELLY INAUGURAL ISSUE...RORO ON WHERE DJAKOUT STANDS! *RORO GIVES US DJAKOUT NEW ORLEANS FESTIVAL PREVIEW! *JENSEN ON THE BIN LADEN ISSUE! *ARE POPULAR BANDS OBLIGATED TO HELP UPCOMING BANDS IN THE "LA RELEVE" MOVEMENT?